For several years, local media companies have been in a nasty predicament. We’ve worked hard for years to build sizable, high-quality local audiences on our websites. And we’ve worked hard to sell banner advertising on those sites. But we haven’t been able to sell what savvy digital advertisers now want and expect: highly targeted impressions on our sites reaching only the individuals with the highest propensity to buy their products or services. All we’ve been able to sell are run-of-site banners seen by all visitors, or banners on certain pages or sections, or in-market impressions. These are clumsy and inadequate substitutes for the hyper-targeting that smart advertisers want today. In digital marketing, the big buzz around Big Data is about the ability to compare each reader’s characteristics against an advertiser’s specs, and — if there’s a match — to fire an ad into place in microseconds. Everyone who uses the Web experiences this constantly. More and more, the digital ads you see are based on the sites you have visited, the content you’ve seen and the searches you’ve done, matched up with your offline characteristics that Big Data companies have managed to compile from a multitude of other sources. By some estimates, this kind of hyper-targeted advertising now accounts for a third of online ad spending. The industry’s smartest analysts say it will continue to grow at double-digit rates. A whole new lexicon has emerged over the last several years around this kind of advertising: real-time bidding (RTB), programmatic buying, hyper-targeting, SSP (supply-side platform), DSP (demand-side platform), DMP (data-management platform), and so on. Searches on any of these terms will produce a wealth of explanations of the processes and technologies. I first blogged about this revolutionary ad technology in August 2012, with this headline: “Here comes the next wave of disruption: hyper-targeting.” The prediction has certainly come true. At that time, we had just started learning about this powerful new form of advertising at Morris Publishing Group. We set out to learn how we could sell it to our customers and, within a few months, we were up and running. Today we generate more than $2 million a year in sales. But not a dime of that revenue comes from advertising sold on our own sites. It’s all from banner advertising sold on other people’s web sites. Ironically, we couldn’t sell hyper-targeting on our own sites because we didn’t have the necessary data on our own visitors. We didn’t really know who our visitors were. The large majority of other local media companies — if not all — were in the same predicament. Even more ironically, other people could hyper-target on local media sites, even though the sites’ owners couldn’t. That was because most of us were placing our unsold remnant inventory on digital ad exchanges. Those exchanges could connect Big Data to our users and sell targeted banners one impression at a time. How weird is that? On the exchanges, at low remnant rates, advertisers could target ads to individually chosen users on our sites. Meanwhile, at our high, direct-sold rates, we could only sell blind, undifferentiated mass buys. 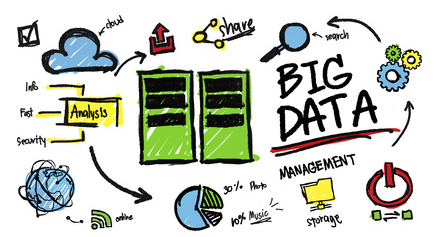 Now there’s an answer: Big Data for local media companies. At Morris, we learned about this solution through the Local Media Consortium, a partnership of local media companies focused on developing mutually beneficial strategies and partnerships. One of the LMC’s most important functions is finding vendor partners and negotiating favorable terms for LMC members. Recently the LMC found and worked out partner terms with Lotame — an experienced digital DMP (data management platform). At Morris, we had a Lotame demo recently. It appears to offer exactly the fix we need for the irony described above. Lotame can ingest our own customer data from various sources — our email lists, print and digital subscriber databases, daily deals registrations and so on. Then it can match up this so-called first-party data with third-party data (explanations here) compiled from online and offline Big Data sources. And it can match up users across multiple devices — desktop, tablet and mobile. The result is a digital database of highly detailed (but not personally identifiable) user profiles. With this platform in place — finally — a local media company can offer its advertisers highly targeted banner ad impressions on its own sites. And the combination of our first-party data with third-party data could make our targeting superior to what’s available on the exchanges. Another vendor that appears to offer a comparable solution is Cxense — a company with deep experience in analyzing user behavior on news sites. We’ll be exploring their solution shortly and comparing with Lotame. These services cost money, of course. How do we cover the costs? It might seem we could do it by charging more for highly targeted banners than we do for our blind inventory right now. But that may not be possible, because all banner advertising is under stiff competitive cost pressure these days and we’re already charging premium prices. More likely, we need hyper-targeting just to stay in the game. ROS is dead among knowledgeable digital marketers and will become harder and harder to sell. For us at Morris, this solution will enable us to sell our own inventory as part of every targeted campaign we sell. Our inventory will come first in the buy, followed by other people’s sites. Hyper-targeting on local media sites is not a silver bullet. It won’t turn those digital dimes of ad revenue into dollars. But in the fast-changing digital advertising environment, it will enable us to stay competitive. And it will help our advertisers reach exactly the people they need to reach — a critical factor in winning and retaining their business. Posted on December 1, 2015, in Advertising, Audience, Digital media sales, Disruption, Media business model, media management, Mobile, Revenue, Sales. Bookmark the permalink. Leave a comment.